Karl Eikenberry’s office in Encina Hall’s East Wing holds hints of a decorated, controversial and adventurous past. Books on politics and history line the shelves, pictures and certificates hang on the walls and an Afghan rug is laid out on the floor. Eikenberry M.A. ’94 has had a distinguished military and diplomatic career. 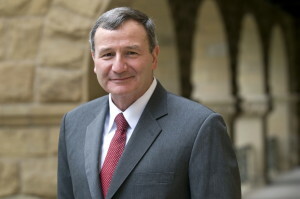 Prior to his current position as the Payne Distinguished Lecturer at the Freeman Spogli Institute for International Studies (FSI), he spent 35 years in the United States Army. As U.S. ambassador to Afghanistan from May 2009 to June 2011, he led President Obama’s civilian surge, which occurred in conjunction with a 30,000-troop surge. Eikenberry, with his soft-spoken manner and friendly disposition, recalled how his father would discuss his World War II experiences in the Asia Pacific region over dinner at his home in Goldsboro, N.C.
“I still consider Goldsboro home,” Eikenberry said, pulling out the key to the city, which was given to him by Goldsboro’s mayor in August 2007. In 1969, Eikenberry left Goldsboro for the United States Military Academy at West Point. He received a letter from the Dean of the Department of Foreign Languages requiring him to study two years of a foreign language. The decision led Eikenberry down a path that would see the fluent Mandarin speaker form close connections with China and the Asia Pacific region. On May 17, 2012, Foreign Policy magazine published an article by Eikenberry titled “Stop Ignoring Taiwan,” in which he argued for revitalizing diplomatic and economic relations between Taiwan and the U.S. in the face of China’s economic and military ascendance. “Over three decades we have quite skillfully managed to balance commitments to Taiwan and continuing to evolve our complicated relationship with China,” he said. “Going forward, with good diplomacy skills we can maintain this balance but…there’s going to be points in time where we have to make difficult decisions,” he added. Eikenberry acknowledged President Obama’s “pivot” toward Asia, citing China’s growing maritime claims as a key issue. “Since World War II, the U.S. had the assumption that we have complete mastery of the military in the Pacific Ocean. As China rises it will challenge our assumption of complete supremacy — how to manage this is the question,” he said. Despite his connection to China and Asia, it is Eikenberry’s efforts in Afghanistan that have been the most noted. Before becoming ambassador, he served two tours in Afghanistan. His first tour was as security coordinator and chief of the Office of Military Cooperation from September 2002 to September 2003, and during his second, from 2005 to 2007, he served as commander of the American-led coalition forces. “The mission was complicated, the expectations in Washington were understandably very high and in the strategy we were implementing, time mattered,” he said. Despite his intense focus on the mission, the people of Afghanistan left the most profound effect on Eikenberry. “There is a saying that when we leave Afghanistan, we leave a part of our hearts behind — this was certainly so for me and my wife,” he said. According to Eikenberry, his frequent walks through Afghan bazaars with his wife, Ching, led him to be dubbed as the “The Afghan People’s Ambassador” by locals. The relationship between Afghans and U.S. troops has been tumultuous, with civilian deaths a major issue of contention. “I would have disagreements with aspects of strategy in Afghanistan but never questioned whether we needed to be there,” he said. “I don’t classify this [the war in Afghanistan] as winning or losing. We are attempting to help the Afghan people achieve progress and make sure we will not be threatened by international terrorism,” Eikenberry said. Here at Stanford, the sandstone arches and palm trees put Eikenberry in a world startlingly different from that of the bustling streets of downtown Kabul or the rugged terrain of the AfPak mountainous border. He particularly enjoys speaking to students about their future career paths, relying on advice his father once gave him. “When it comes to the end of the day in life’s journey and what you see in the mirror makes you smile then you can say you did reasonably well,” he said.